We begin this post with the immune checkpoint inhibitors, a type of immunotherapy that is explored in seemingly every type of cancer, including SCLC. Reports from two clinical trials of these drugs were recently made available at two meetings on lung cancer treatment. In the first study, CheckMate-032, patients with pretreated SCLC received either the PD-1 inhibitor nivolumab (Opdivo) or a combination of Opdivo and the CTLA-4 inhibitor ipilimumab (Yervoy). Of the patients who received only Opdivo, 12.7% showed a partial decrease or disappearance of the signs of their disease (objective response rate, or ORR); 16.4% of the Opdivo-only patients had stable disease (SD). For patients who received both Opdivo and Yervoy, the ORR was 31.1%, with a 2.2% complete response rate (no more signs of disease). The SD rate for the combination was 22.2%. One-year survival rates were 27.1% and 47.5% for the Opdivo-only and combination groups, respectively. This is encouraging compared to historic data on the survival of SCLC patients treated with chemotherapy. 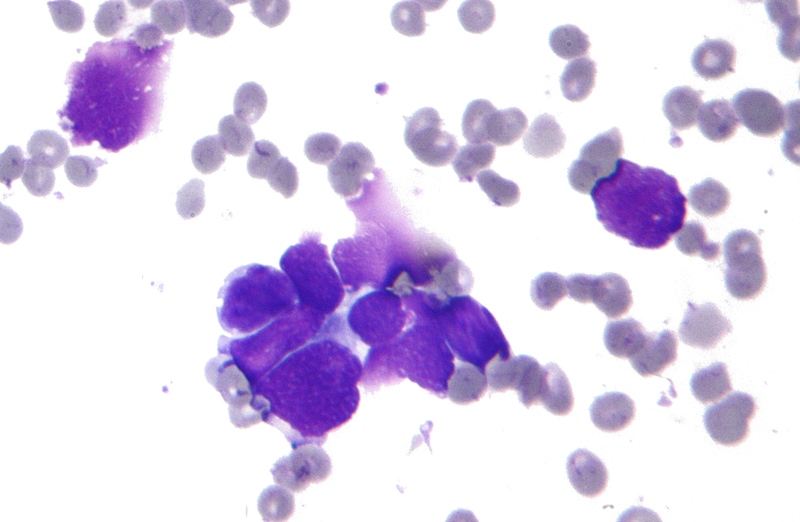 In the smaller KEYNOTE-028 clinical trial, 24 SCLC patients received the PD-1 inhibitor pembrolizumab (Keytruda). The ORR was 29.2% (all were partial responses, PR), and the SD rate was 4.2%. These results are encouraging, but combining PD-1 inhibitors with other treatments (chemotherapy, radiotherapy, or targeted drugs) is the next step in trying to improve the efficacy of PD-1 blockers in SCLC; several clinical trials are already testing this (NCT02402920, NCT02481830, NCT02472977, NCT02331251, NCT02551432). Rova-T, as the drug will be widely known, is an ADC drug—an antibody-drug conjugate, in which the antibody part recognizes and binds to a protein called DLL3, which is reportedly found in 70% of SCLC tumors. The antibody part is linked to the cytotoxic (cell-killing) drug tesirine. When the antibody part binds to DLL3, the drug is absorbed into the cancer cell, where it damages DNA and kills the cell. The company behind ROVA-T, StemCentrx, published a paper in August demonstrating the high efficiency of this drug in eliminating SCLC tumors in mice. The paper explains that Rova-T specifically targets tumor-initiating cells, which are closely related or identical to CSCs. In a clinical trial with 73 SCLC patients, ROVA-T produced excellent responses in patients whose tumors were positive for expression of DLL3: 44% of these had PRs and 34% achieved SD. Most patients in the trial were not evaluated for DLL3 expression; responses in this group were 23% and 68% for PR and SD, respectively. In the same trial, patients with DLL3-positive SCLC who had previously responded to standard treatment with etoposide and cisplatin, but relapsed later, had an ORR of 64% with Rova-T. This is an unheard-of rate of response in relapsed SCLC. Even patients who relapsed after two lines of chemotherapy showed an ORR of 45% when they received Rova-T. Even more remarkable is the observation that responses to ROVA-T lasted for more than 300 days in many patients. A phase II trial of ROVA-T is slated to start early next year. DLL3 is a protein found on the surface of cells and is part of the NOTCH pathway, which is known to play a role in cancer, in particular in maintaining CSCs. However, ROVA-T does not inhibit DLL3 or the NOTCH pathway; it just uses DLL3 as a way to hitchhike into the cell and deliver its load of a chemical toxin that kills the cell from inside. Another drug that targets the NOTCH pathway has shown very encouraging results in untreated extensive-stage SCLC. Tarextumab targets NOTCH receptors directly. When combined with the standard chemotherapy regimen for SCLC, tarextumab showed an ORR rate of 100%—mostly PR (77%)—and a 20% SD rate. Most important will be the data on the durability of these responses, but these are not available yet. The trial is still enrolling patients (NCT01859741).